A week ago I was in Malaysia, having been invited to deliver a series of lectures on Islam, women’s rights, and a critique of liberalism and feminism. The organisers, Wanita ISMA (an Islamic NGO), had hoped to supplement my tour by organising a panel discussion between me, ISMA, and two members of a small (but disproportionately vocal) secular liberal group deceptively calling themselves “Sisters in Islam” (SIS). SIS attempts to campaign for secular liberalism and feminism under the guise that these ideas are ‘compatible with Islam’, and claim to be open for debate, discussion and dialogue about ‘Islam’. However, to my knowledge, SIS have never actually invited people who hold different opinions (i.e. mainstream Islamic opinions, like ISMA) to discuss and debate with them on their platforms. Rather, SIS have been content purely to float their views – unopposed – from the safe distance of the internet and the media platforms they are given. Furthermore, ISMA informed me that previous attempts to hold a debate or discussion with SIS have ended up invariably with SIS pulling out at the last minute. As I have always thought that the best way to test the integrity of ideas is to subject them to scrutiny and debate, I nevertheless asked ISMA to setup a dedicated discussion event while I was in Malaysia, where ISMA and MDI could engage with SIS, on the topic, “Is the shari’ah male-biased, and do we need a feminist interpretation?”. As SIS have been known to pull out of events in the past, ISMA wanted to do everything possible to prevent this from happening again: SIS were offered to bring a portion of the event attendees from their own supporters, and after SIS accepted a panel of three speakers (one from MDI, ISMA and SIS), I urged ISMA that it would be fairer to invite two speakers representing SIS (lest they claim after the event that the panel was unbalanced). To prevent SIS from claiming in the lead up to the event, that the event had become too sensationalised in the public, it was also decided hold the discussion as a “closed” event (i.e. not open to the public). SIS accepted the invitation with these conditions, saying that they would be sending Ratna Osman (Executive Director, SIS) and Mohammad Afiq Noor (Assistant Manager for Legal Advocacy and Public Education, SIS). ISMA then went to work making costly and time-consuming arrangements for a suitable venue and video recording (to be uploaded afterwards for all to see and share in the discussion). Whilst I was in Malaysia, I asked ISMA if perhaps a panel of four people may be too cumbersome, and that it may be a better idea to facilitate even deeper investigation of the question at hand, by having a 1-on-1 event (between Ratna Osman (SIS) and myself (MDI)). The more speakers that there are on a panel, the more shallow a discussion ends up being; a 1-on-1 would allow each side more time to develop and discuss their views and ensure a deeper discussion of the issues at hand. ISMA emailed SIS to ask if they were happy to make this change. However, Ratna Osman (SIS) explained that she was not interested in engaging with a “foreign” speaker, and DECLINED to debate if it was not possible to keep to the agreed format. “Unfortunately the latest email from you that we got today of another change, does not have any ISMA speaker, but a foreign speaker from Muslim Debate Initiative, Ms Zara Huda. As much as we look forward to engage in a dialogue with Ms Zara Huda, I was under the impression that you initiated the forum so that SIS and ISMA would know more of each other’s work and views on Shariah. ISMA, in a sincere wish for the event to go ahead, reverted to the original plan – a 2 on 2, to directly accommodate SIS’ demand to include ISMA. It is strange that SIS seemed to be so keen to discuss with ISMA when, prior to my arrival in Malaysia, they had never, to my knowledge, invited ISMA to any of their public events – nor ever followed through with any forums/debates that ISMA had agreed to attend. On a personal note, I also find it strange that SIS were so reluctant to debate me, a “foreigner” when they are totally happy to believe in and advocate foreign ideas – as well being founded by foreigners (i.e. the American arch-secular feminist Amina Wadud, no less)! Now that the racist demand of not wanting to deal with a “foreigner” had been resolved, and ISMA kept the originally agreed format, one would expect SIS to have no good reason to turn this opportunity down – wrong! Lo and behold, SIS, on the day of the event sent an email CANCELLING, causing ISMA not only financial loss, but sincere disappointment in watching SIS yet again turn away from discussing and subjecting their views to open debate, scrutiny and discussion. Understandably, in response to the cancelling of the event, ISMA made a Press Release exposing SIS’ failure to turn up. Bizarrely, SIS responded that they pulled out due to ISMA’s supposed lack of “professionalism”. Indeed, “professionalism” does go a long way – for example, not dismissing candidates from discussion because they are “foreign”, keeping one’s word and promises, or even refraining from pettiness and childishness from one of the intended SIS panellists no less, Assistant Manager for Legal Advocacy and Public Education, Mohammad Afiq Noor, who ably demonstrates his ‘professionalism’ by piling on derogatory, and sexist remarks about this “foreign” speaker, referring to me as a “Clothing brand”, and a “fool” for whom the best response is silence (which they still failed to do! [unless they were perhaps advising me not to respond to them?]). Translation (Arabic): If a fool speaks, then do not respond – the best response is silence. If this is the “professionalism” and calibre of intellect one can expect from SIS, it is no surprise that they are reluctant to have their arguments challenged in a live event, away from the safety of their computer screens. One can only wonder if they were reluctant to debate someone who usually debates, in the West, the non-Muslim Secular Liberal and Feminist role models of SIS, and who SIS look up to and are just a pale imitation of. Or perhaps they were reluctant to debate someone who comes from the West and would disabuse the Malaysians of the false conception of the West being the “utopia” that SIS would portray it as. If SIS truly possessed the courage of their convictions, why are they so timid? Are they afraid that their own followers would hear of a new explanation which transcends their secular liberal dogmas (that they have blindly borrowed from the West), and encourage them to truly think outside of the box? 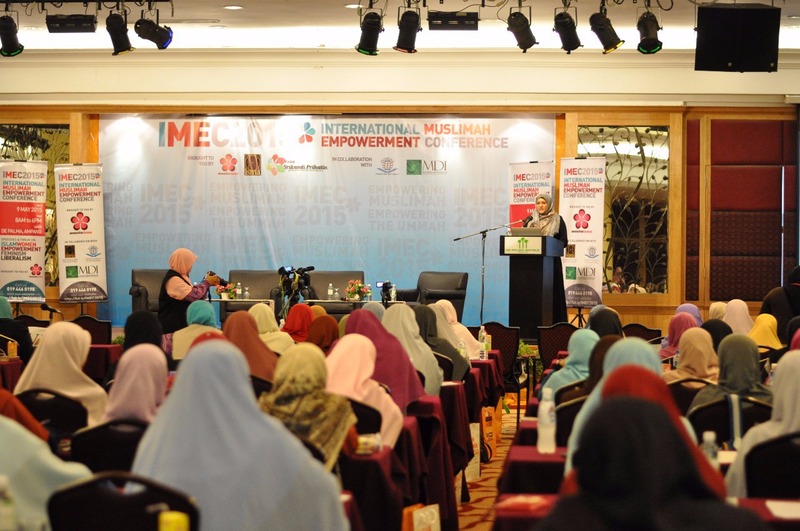 The day after the debate was supposed to take place was the International Muslimah Empowerment Conference (IMEC) 2015, where I presented my lecture entitled, “Feminism: Heroin(e) of the Masses” (now available to view here). Within this lecture, I discussed feminism and secular liberalism and propounded rational critiques of these philosophies, including whether or not they had truly produced success and happiness in the West. I exposed the so-called “Islamic Feminism” espoused by secular groups plaguing the Muslim world (usually set up with foreign Western support), for what it really is: the ‘reconciling’ of liberal values with Islam, by substituting it in place of the Qur’an’s values, under the guise of “interpretation”. Secular Feminist reformists in the Muslim world have realised that their feminist claims cannot be satisfied through the reinterpretation of texts alone – rather, they now go so far as to claim that the problem is with the sources themselves – i.e. the Qur’an itself, and the Prophet himself . And to this end, SIS are a case in point. I mentioned during my speech, the American Amina Wadud, one of the original founders of the feminist organisation, SIS, claims that for explicit verses of the Qur’an that feminists are unable to ‘reinterpret’ (i.e. twist), the possibility of rejecting these verses should be considered. Wadud states that she has “come to places where how the [Quranic] text says what it says is just plain inadequate or unacceptable, however much interpretation is enacted upon it”. She continues to propose that because particular articulations in the Qur’an as a text are problematic, there exists the “possibility of refuting the text, to talk back, to even say “no””  to the Qur’an! Wadud is proposing that rejecting the text of the Qur’an itself is a possible solution when the text of the Qur’an does not live up to feminist ideals. I mentioned in my speech that this founder of “Sisters in Islam” seems by her claim to want to be out of Islam. Considering that this is the position of SIS’ foreign founder, who SIS describe as being one of seven founders who ‘formed the core of what was to become Sisters in Islam’, it is hard to imagine why they would not be reluctant for someone to point this out in public, and make them answer to scrutiny over just how faithful to Islam and its texts they truly are. Of course, any pretence of basing their ideas on Islam, is merely a smokescreen to facilitate the acceptance by Malaysians of what are, in essence, foreign and un-Islamic ideas that have no basis in the Quran, or rationality. So, why are Malaysia’s secular liberal groups so afraid of debate? Malaysia’s secular liberals are all for “debate” it seems – as long as their side are the only ones speaking. I stumbled onto your debate video with Marina Mahathir and am curious to know more of your writings and thoughts. I am a Malaysian myself and am concerned with the rising gender politics in Malaysia (now along with SIS we also have self professed feminist Myriam Lee who comes up with so pathological and self victimising ideologies that i believe would only serve to divide the Muslims in this country). I confess I am not a very pious Muslims (who sometimes find it hard to stick to the dogma of the religion), but I do admit that abiding by the Islamic way of life have been the most fulfilling and beneficial for me, spiritually. I worry though for the day the structure of this way of life i have always been to be chipped away and eventually destroyed to make way for these new ideologies brought on by wolves in sheep’s clothing. Please continue writing and please reach out to more muslim ladies (and men) who may not know better. I hope to be able to attend your talks in Malaysia should you ever want to come down here again. I stumbled upon this article after reading about Feminism Theology by a friend of mine on Facebook. I was astounded upon how hypocritical the secular liberals under the guise of Islam are in debates and conferences.